Despite gloomy forecast about the impact that Russian former Finance Minister Alexei Kudrin’s resignation may have on the country’s Finance Ministry, it has proven to be wrong. After the resignation of tough-minded Finance Minister Alexei Kudrin, many analysts thought that the Russian Ministry of Finance would become a docile agency. 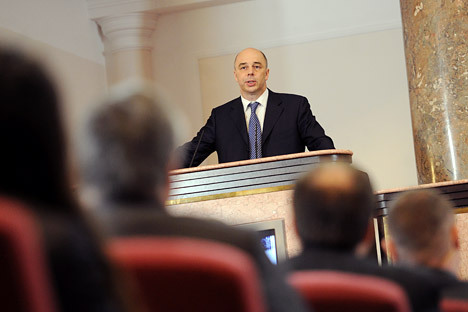 Kudrin’s successor, Anton Siluanov, was seen as a puppet under which the ministry would be totally powerless and lacking initiative. Almost a year has passed since Kudrin left office, and these forecasts have been proven wrong. Far from yielding ground, the Ministry of Finance has put forward some proposals that suggest it is positioning itself as an independent player in the Russian political arena. “From the outside, it may appear that the Russian executive branch is a monolithic structure,” said political analyst Mikhail Romantsov. Perhaps the most interesting proposal that has recently emerged from Siluanov’s agency is the one that suggests creating a mega-regulator by placing the Federal Financial Markets Service under the wing of the Central Bank. Sources at the Ministry of Finance say that the main aim of the merger is to minimize the differences between various structures and consolidate document processing in a single network. Critics of the measure argue that the Central Bank’s takeover of the Federal Financial Markets Service (FFMS) will give rise to the new structure being vested both with legislative and executive functions, which may be bad for market freedom. But the Ministry of Finance reassures its critics that the establishment of a separate agency to fight insider trading and protect the interests of consumers and the rights of minority shareholders will counter any negative consequences the move may bring. Another characteristic of the Ministry of Finance that has remained intact since the Kudrin administration is its tough stance on what it considers to be non-targeted spending. He was referring, above all, to the 20 regions where the debt exceeds half of overall revenue. The heads of local administrations took issue with the idea, not wanting the federal center to poke its nose in their budgets without contributing any other useful ideas. Responding to the criticism, the Ministry of Finance advised the regions to, firstly, obtain loans not only from the state but also from commercial banks and, also, to think about cutting the number of civil servants. Concerning the matter of downsizing, optimizing the work of government bodies is also on the agenda. It has been suggested that the number of officials be cut by a quarter and that the salaries of those who remain be raised. The cuts would involve fixed-term contracts, which effectively amount to outsourcing. Vladimir Nazarov, an expert with the Gaidar Institute for Economic Policy, claims that this would be a very useful step for Russia to take. However, the Ministry of Finance believes that it is not just the civil servants who are derelict in their duties, but parliamentary deputies as well. Recent rumors had it that the ministry had prohibited lawmakers from interfering in budget matters. The rumors managed to make a big stir among deputies before they were finally denied. International analyst Yevgeny Morzhov believes that the Ministry of Finance’s idea suggests that the global technocratic trend is spreading to Russia. “People in developed countries, especially in Europe, are fed up with politicians,” Morzhov said. Some believe that the most recent Russian government was deliberately formed from technocrats who would balance off the professional politicians. “Of course the experts’ initiatives are less impressive and fanciful than the proposals coming from the deputies,” Mikhail Romantsov said.